Exotic animals are often smuggled on the black market in terrible conditions but thanks to U.S. Customs and Border Patrol agents, a baby tiger was freed from a duffel bag. 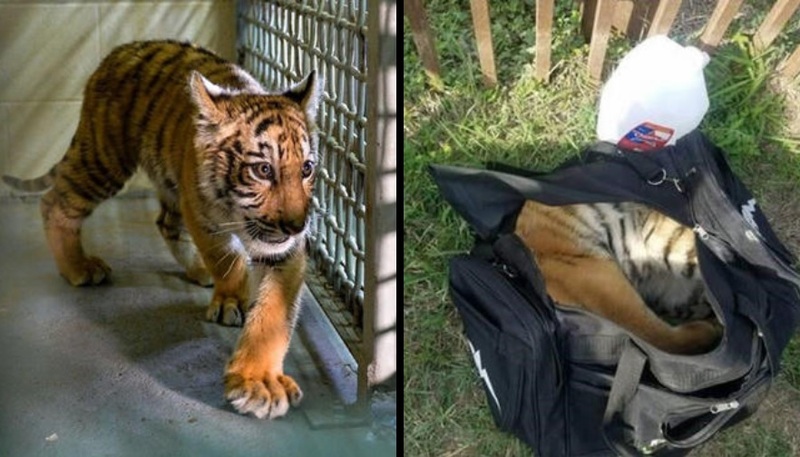 The agents intercepted the living cargo near Brownsville in Texas and found the tiger cub to be very calm. The animal was believed to be around three or four months old and was being carried in a duffel bag by three men trying to enter the U.S. illegally. Agents believe the animal may have been sedated and took him to Gladys Porter Zoo where he made his recovery. The tiger has been named Kenobi and will be relocated to a new home in North Texas Friday. He was found in a duffle bag that was abandoned by three spooked Mexicans attempting to cross the border. The Border Patrol agents were patrolling along the Rio Grande when they encountered the group. Border Patrol officials believe the men intended to sell the tiger cub. Texas has the second largest population of tigers in the world after India. Kenobi will be relocated to his new home at In-Sync Exotics in Wylie, Texas and he won't be alone. The adorable baby tiger will have a white tiger cub to play with. In-Sync Exotics has offered to provide Kenobi a home, veterinary care and plenty of friends. Estimates put the number of tigers in Texas well over 2,000 with many of them existing as backyard pets.